The most important part of this build is to make sure that this Civic drives and handles as OEM as possible. To achieve this Daniel from Impossible Fabrications has been a very busy man. The idea is to take the geometry out of the S15 front end before we stripped it and mirror that in the civic. It sounds simple, but in fact you have 4 axis to play with in the front end of a car, and when you have to make your own chassis rails all this does is add fuel to the fire. So come and take a look at what we got us to this week. The first step was to remove all the fluids and exhaust from the little civic. While i went about draining the oil from the box and the motor Daniel “unbolted” the exhaust with his new Saw spanner. Next came the big gun 1.3L carby motor. All jokes aside this motor was great to me, cost nothing to run, didnt burnt a ml of oil and never even threatened to not turn over first time everytime. 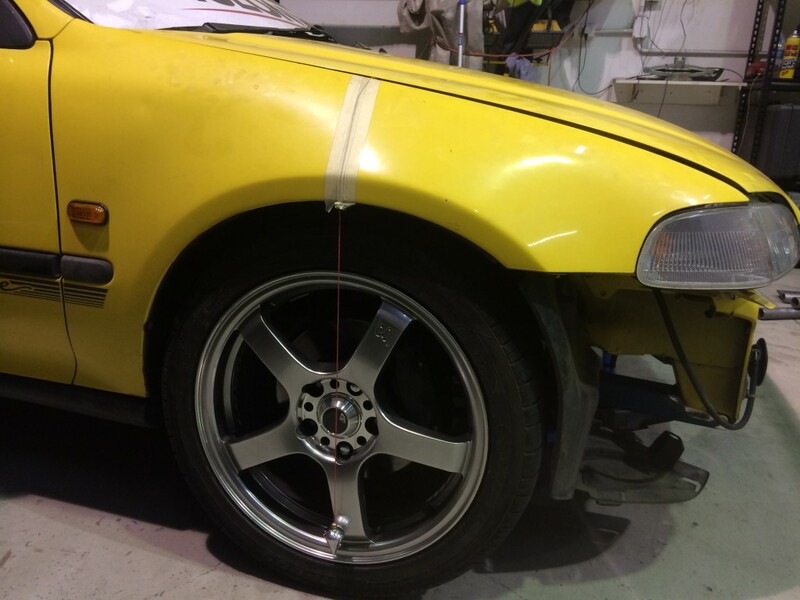 Next up it was time to string line the civic wheel arch, This is very common practice when building a car or even taking a front end out for servicing, Getting this right is critical to the success of our project. We need to make sure the S15 hub is in the dead centre of the Civic wheel base. This line will also dictate where are SR20 will end up sitting as we are going to try and use the factory engine mounts if we can. We tacked some support bracing in the front end while we trail fitted it, this keeps everything together to make it easier to move around. As you can see we have alot of work ahead of us just to get the front end to even touch the civic. We have to custom make mounting points for the S15 cradle to bolt into the Civic chassis. Funnily enough the front mounting points were alot closer, all we have to do is drill out some holes and bolt them out. Here is the 5 stud hubs in there final resting spot, now it was a matter of making the rest of the front cradle line up with what we had done. Getting the s15 hub into the correct position took around 6 hours of looking, thinking, touching, thinking and then looking. It pays to spend the time on this as it will affect the way the car feels on the road and track. Daniel has done a few of these before so made it look super easy, but something tells me there isn`t to many people that could get the front end to fit so well. Next up were the shocks for some Impossible Fab loving. The factory mounts were no where near the correct angle or height so we needed to make some custom mounts to get the shocks in the factory S15 position. The way we ended up doing this was to chop off the Civic strut tops and graft the S15 strut tops into place. After a few days of swearing, kicking and throwing more than 1 hammer we ended up with one Civic chassis rolling on the factory S15 front cross members with Cusco coil overs. We cant believe how well this rolls with the new front end in it. We are a little nervous about the ride height but if it aint low then it wont put on a show right? Stay tuned for more updates on this little car. We are all systems go now working out how to get this north south motor with 6 speed gearbox nice and comfy in the civic chassis.